Find out what TripAdvisor travelers ranked as their top five must-see landmark attractions to visit according to this year’s Travelers’ Choice Awards. The list includes ancient archaeological sites, iconic structures and architectural masterpieces. Have you seen any of these amazing world wonders? 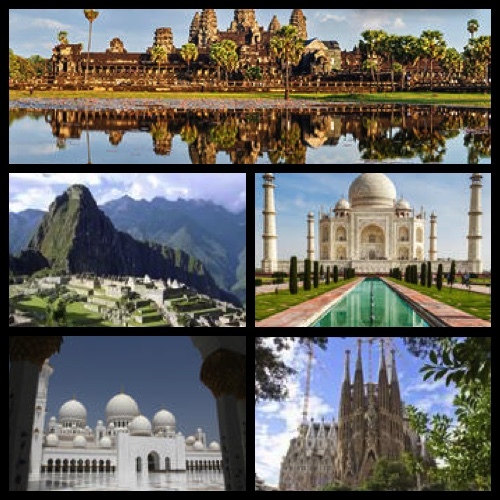 This entry was posted in Asia / Far East, Central America / South America, Europe, Travel and tagged abu dhabi, agra, angkor wat, barcelona, cambodia, india, machu picchu, peru, sagrada familia, sheikh zayed grand mosque, taj mahal on October 26, 2015 by Alana. Barcelona is Spain’s most popular tourist destination. Steeped in history, art and culture, the picturesque city makes a great family vacation destination. Visitors flock here from around the world to explore Barcelona’s historical sites, cathedrals and temples, world-class museums and art galleries, sandy beaches, fun restaurants and sizzling nightlife. Wish we were there now! This entry was posted in Europe, Fun Things to Do, Travel and tagged barcelona, barcelona attractions, barcelona bus tour, barcelona sightseeing, Barcelona Tours, barcelona vacation, casa mila, europe, europe vacation, Fun Things To Do in Barcelona, gaudi, gaudi architecture, le pedrera, mila house, parc guell, sagrada familia, spain, spain vacation on February 4, 2010 by Alana and Barry.